Almost Sold Out For Xmas! We are almost sold out for Xmas, only a few flipping and worm weights left! 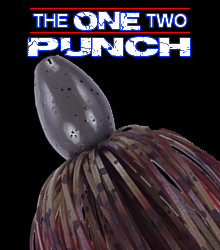 Football Jigs and One-Two Punch weights are completely sold out! They are in stock at Tackle Warehouse, we just sent a huge shipment over to them. Merry Christmas everyone!!! We should have everything back in stock after the Holidays. Feel free to send me a message or give me a ring if there is anything in particular you are looking for and I will get you on a priority list. Thanks again all! Evolution Tungsten Moved to Florida! We have officially moved to Florida! Cant wait to start a new year flipping and punching toads on Lake Okeechobee! Our 2 1/4 oz and 2 oz weights have completely sold out with Chad Morganthaler's BASS Wildcard win on Lake O for the final BassMaster Classic spot. Congrats Chad, I thought Shaye Baker was going to walk away with it after day one but you kept consistent through the weekend! Good luck to all the College teams fishing the Big O next week, especially Auburn and AUM using our 2 oz'ers! Had this one come in from Matt after placing an order here on the site. This is what we are all about, putting out a quality product that helps you stick more fish! We fish our own products exclusively too, so if it doesnt cut it with me, it doesnt go on the shelf, period. I'll keep tying em up if you guys keep piercing lips with em! One of our customers sent these pics to us, all of them caught on Okee Craw One-Two Punch weights with Rage Tail trailers. Nice Job Nathan! 12.98 POST spawn, thats a toad! Couple 8's and a 9 in there as well I think he said. Wish we had a decent flip bite this year, Im jealous! On that note, if you have some pics of great fish you want to show off, let us know in the contact us section! I'll put pics in a Bragging Board section of the Pro Staff page.